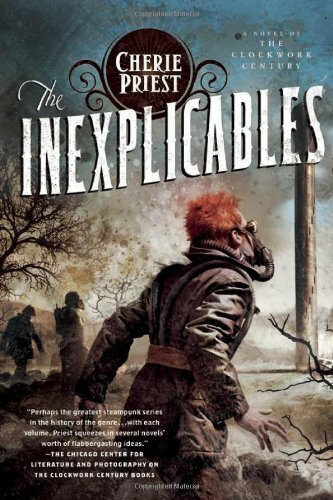 Cherie Priest has gotten dumped on a bit for this one, with some calling it the weakest of the Clockwork Century books. I think that's a bit unfair. Even though it's clearly not the strongest entry by a long shot, I think I enjoyed its basic story (and certainly the back half) to be much more enjoyable than Clementine. That still remains the weakest entry for me. That said, I think most people have issue with the main character, Rector. He's a whiny, angsty teenager with a drug addiction. This isn't a coming of age story, though. It's a redemption story. I applaud Cherie Priest for writing a protagonist that isn't likable from the word go and turning him into someone who eventually is. She's written her fair share of anti-hero protagonists, but all of them had a certain rogue charm as soon as the reader is introduced to them. Rector doesn't. His utter lack of charm as a thief and junkie makes the first few chapters of the book a big of a slog, but it creates a real arc for the character that moves slowly and has a payoff. I enjoyed returning to the Blighted Seattle of Boneshaker (which will still remain an epic that's head and shoulders above everything else in Clockwork Century except for maybe Ganymede) and seeing all of the characters introduced in many of the previous volumes work together to take out a new series of threats to their poisoned but hard-earned city. Definitely a worthy volume to read if you're into the series, but I certainly wouldn't start here. You will be lost and perplexed. Definitely start with Boneshaker.